We’d love your help. Let us know what’s wrong with this preview of Personal by Lee Child. To ask other readers questions about Personal, please sign up. To me thiis book is very different from other Reacher tales. It is too wordy, cerebral and boring. But Lee Child can write so you will wizz throught it as usual. Maybe he wrote it for a screenplay venue. Did anyone else find it different from the usual? Edward Wolfe I was about 40 pages in (which took a couple days, which is highly unusual for a Reacher book) when I asked out loud, "Who wrote this?" But I didn't care for this book at all. Actually my least favourite book of Reacher. I'm the type of person that buys books on pre-order. Lots and lots of them. However....there are only two authors I actually READ on release day.....John Sandford and Lee Child.....Usually I read Lee's in a single sitting....no more than two days....This one took me over two weeks to muddle through it. I've been trying to figure out why this one is so different for me. It's taken me a bit, but I think I figured it out finally. Reacher wasn't on his own. I understand he's been part of makeshift teams before. However, even as a team member he was always on his own....working for himself....because he wanted to correct some wrong in the world. This book was full of politics. It was just bogged down. The story line just got lost in all the politics and the conspiracy and back office deals. Reacher felt like a puppet in this novel. He had no personality. I see England, I see France, I see Reacher's underpants. No, only fooling. I've never seen Jack Reacher's undies, although I wouldn't mind doing so as long as it was the “real” Reacher and not the Tom Cruise midget Hack Reacher Hollywood version. Does Reacher even wear underwear? Has Lee Child ever told us? And if he does, are they tighty whities or boxers? Anyway, how did we get on the subject of Jack's foundation garments? Oh, yeah, I was talking about seeing England and France, which we get t I see England, I see France, I see Reacher's underpants. Anyway, how did we get on the subject of Jack's foundation garments? Oh, yeah, I was talking about seeing England and France, which we get to do in this novel, and that's what makes it fun to read. Those of us who have been with Jack Reacher from the start have grown a mite weary of seeing him land in yet another creepy one-hydrant small town somewhere in the bowels of America. So Lee Child got smart and made him a world traveler in this latest installment. I don't know about the rest of you, but it really purples my nurples when I look at a review of a book I've been anticipating with great relish, only to have one or two lines in that review ruin it all for me by giving away too much information. I don't generally write much in the way of reviews for books in the suspense/thriller category because I'm afraid that one little thing I say might spoil it for some eager reader. So how to review this book? Without spoilers. Without even a hint of spoilers. You can read the publisher blurb and get a pretty good feel for the general plot, but even those dadgum blurb writers seem to include spoilers these days. What I will say is that this book was one heck of a lot of fun to read. There's a great mix of characters we've never met before. There are colorful English hoodlums and American military has-beens and world-class snipers, one of whom takes a shot at the president of France, which sets the wheels in motion for Reacher to seek a confrontation with a guy he put in prison over 15 years ago. This is a super-intelligent thriller with some great humor thrown in. I won't tell you my favorite laugh-out-loud lines, because I want you to be as surprised and delighted by them as I was. Seeing how Lee Child is so smart and does his research so well, I was surprised to find that he didn't do his homework on pharmaceuticals for this novel. He apparently has Zoloft confused with Xanax, and has a major female character popping a Zoloft whenever she's nervous or needs to sleep. That's my only real criticism of the book. I read an advance copy, and I hope the error will be corrected in the final version. I see there is a lot of debate between Lee Child fans about whether this is a good book or not. I liked it four stars worth! Okay it was a bit different especially as the action takes place in Europe instead of America. I actually found that a refreshing change. And it does get a bit wordy in parts but makes up for it with some great action and an intriguing game of double guessing who the real baddy is. I really enjoyed it. They persuade us that however terrible the situation, some sort If you're into stuff like this, you can read the full review. Man, I can be a diehard fan of someone as much as the next guy, but, after reading Personal, I felt the same way I did after I read the latest John Sandford novel. I felt like I'd been had, that these guys are slacking and leaning a little too heavily on their fans to prop them up, like they are coasting, like they are semi-retired rich dudes just waiting for the checks to roll in. Well, screw that, boys! There are too many people out there who are still TRYING to write something worth reading for me to waste too much time or money on that crap! I've already scrapped Sandford's Virgil Flowers series as he carelessly allowed one of his golfing buddies to get a little too involved and turned out a piece of crap, and I'm not afraid to throw any future efforts in the Reacher series on the scrap-heap, too. A page turner filled with action, thrills and violence aplenty. However it feels like something is missing that exists in the other Jack Reacher books. I don't think Jack being the narrator helps as it seems to spoil the action having everything explained, often beforehand. Enjoyable and a quick read but not the best in this series in my opinion. A solid Jack Reacher novel by Lee Child. A sniper is wild ... trying to assassinate a G8 leader in the G8 summit in the UK. The sniper and Jack Reacher got a history. A solid page turner and full of blood and guts ... bullets and chases.. cars... London.. Paris and the USA. By coincidence, Jack Reacher picked up a discarded Army Times newspaper and discovered a classified ad directed at him – contact Shoemaker it said – and as he owed the General a favour, he did just that. But in doing so, the direction of his aimless wandering changed considerably; sixteen years previously Reacher put a man in prison – he learnt that man had been out for twelve months; was Reacher going to have to hunt him down again? On learning that the President of France had been targeted by a By coincidence, Jack Reacher picked up a discarded Army Times newspaper and discovered a classified ad directed at him – contact Shoemaker it said – and as he owed the General a favour, he did just that. But in doing so, the direction of his aimless wandering changed considerably; sixteen years previously Reacher put a man in prison – he learnt that man had been out for twelve months; was Reacher going to have to hunt him down again? On learning that the President of France had been targeted by a sniper, and an expert in long range shooting as well, the governments of each country reacted immediately. With the G8 summit destined for London in the near future it meant that cooperation was needed on a grand scale. Accompanied by Casey Nice, a young and relatively new CIA agent, Reacher headed for London where they needed to do intense investigating, but under cover – the Brits weren’t to know they were there. As Reacher and Nice moved deep into the London underground, the danger mounted. Reacher knew who he was after – but there were other elements at stake. Would they manage to get out with their lives? I was disappointed in this latest instalment by Lee Child. An extreme amount of dialogue (by Reacher) with occasional bursts of action – it had me wondering when it would improve. I’ve previously enjoyed every book in the Jack Reacher series, but felt a little bored and let down by Personal. It almost felt like it was written by someone else. But in saying that, I urge Reacher lovers to give it a go – it could just be me! The evidence suggests that this may have only been a practice round. The leaders of the G8 nations One day in Paris someone takes a shot at the President of France from three-quarters of a mile away and damn near hits him, but a sheet of bullet-proof glass in front of the podium deflects the shot. Only a handful of people in the world could have made that shot, and probably only one American--a sniper named John Kott who was released from prison a year earlier after doing a fifteen-year stretch. Nothing really happens until the 16th chapter, page 87 ... unusual for a Jack Reacher novel. Lee Child likes to set the foundation in detail. I realize that it's necessary to a point, but this novel, unlike the other Reacher novels I've read, focuses primarily on strategies, hypothetical situations & scenarios, and way too much detail about the artillery/ammunition used or not used as in some cases. He goes into all the technical stuff, such as velocity of bullets, ranges, angles, specificat Nothing really happens until the 16th chapter, page 87 ... unusual for a Jack Reacher novel. Lee Child likes to set the foundation in detail. I realize that it's necessary to a point, but this novel, unlike the other Reacher novels I've read, focuses primarily on strategies, hypothetical situations & scenarios, and way too much detail about the artillery/ammunition used or not used as in some cases. He goes into all the technical stuff, such as velocity of bullets, ranges, angles, specifications, material used, etc., I mean pages of this. “Personally,” this reader just wanted him to get on with the story. The knock-down drag out fist-fighting is much the same, a blow by blow description of how it went down, to get the bad guy ... and when he finally gets the bad guy, which we all know he is going to do, it seems anti-climatic. I've skimmed through this part of his novels in the past, but found myself tempted more often by this one. I like the character of Jack Reacher, and will continue reading any future releases. If you haven't read a Reacher novel, don't start with this one. Even though each can be read independently, you will enjoy the series a lot more if you start with Book 1: The Killing Floor. Then you can see how Jack grows through the years as he stumbles across various situations, always ready to help the underdog. It pains me to give such an acclaimed author a rating as low as 2-stars, but I'm trying to be honest here. Look, I've read every Jack Reacher book. Lee Child is one of my favorite authors. But by the time you get to the finale, you're just like "Wait, what? This doesn't even make sense. Is this really happening?" I thought about giving an extra star because there's a fair amount of energy in the book--it's a mess, but it's a fast-paced, rollicking mess. In the end, I decided to use one of my rare one-star ratings to wave off other folks. Just to check that I wasn't crazy, I handed it off to my wife wi Look, I've read every Jack Reacher book. Lee Child is one of my favorite authors. But by the time you get to the finale, you're just like "Wait, what? This doesn't even make sense. Is this really happening?" I thought about giving an extra star because there's a fair amount of energy in the book--it's a mess, but it's a fast-paced, rollicking mess. In the end, I decided to use one of my rare one-star ratings to wave off other folks. Just to check that I wasn't crazy, I handed it off to my wife without saying anything about the book. She's a Lee Child fan too, but she really didn't like Personal either. She considered it a two-star book. Somebody takes a shot at the french president and he gets saved by a new safety glass but suddenly all major security servies get mighty nervous. they make a list of the possible shooters who might be able to do a shot like the one aimed at the French president. This list contains one wrathful person who has been put into jail by a certain military policeman by the name of Reacher. So the powers that be in the US want Reacher on the case and ship him to France were Reacher finds the weather pleas Somebody takes a shot at the french president and he gets saved by a new safety glass but suddenly all major security servies get mighty nervous. they make a list of the possible shooters who might be able to do a shot like the one aimed at the French president. This list contains one wrathful person who has been put into jail by a certain military policeman by the name of Reacher. So the powers that be in the US want Reacher on the case and ship him to France were Reacher finds the weather pleasant especially the wind. His Russian counterpart loses his head due to the weather. Next stop London England where the organised crime find out that while Sherlock Holmes might be fiction, Sherlock Homeless as some people call him makes a quite formidable threat. When Reacher flies home he has tracked down the sniper and finds the one responsible for aiming the shooter. More Jack Reacher then and I enjoyed this one more than the last (not as much as the early ones) but it was very good. They always are. No messing around here, Jack Reacher is Jack Reacher and that is kind of comforting. Don't expect any surprises there are not any. The thing I mostly enjoy about these when I think about it is the fact that they are easy, predictable, do exactly what you expect them to do and are perfect reading when you don't want to have to think too much but want to be enterta More Jack Reacher then and I enjoyed this one more than the last (not as much as the early ones) but it was very good. They always are. No messing around here, Jack Reacher is Jack Reacher and that is kind of comforting. Don't expect any surprises there are not any. The thing I mostly enjoy about these when I think about it is the fact that they are easy, predictable, do exactly what you expect them to do and are perfect reading when you don't want to have to think too much but want to be entertained. Jack Reacher is highly entertaining. He was here. The story is good, flows out in its usual indomitable style, Jack pops into some lives, gets rid of some bad guys, puts the good guys back on track, doesnt stand for nonsense and, well, buys a toothbrush. And some new clothes. Considering how simple it sounds (and in a lot of ways it is) I was enthralled as ever. These are good readable books of the type that don't make promises they can't keep and the success of the series does not surprise me one bit and is absolutely deserved. Lee Child may never write War and Peace but he will be read forever I have no doubt. Reacher is playing an away game in this non-stop action thriller. Mostly takes place in Paris and London, but now he is a one man wrecking crew on two continents! I enjoyed this episode in Reacher's life as much if not more than previous books. As part of the "praise" for the book at Amazon.com, another favorite author of mine, Stephen King, calls this "The best one yet." It may not be the best I've ever read, but it's sure close to the top. The only real downside was the monumental effort it took not to envision the comparatively scrawny Tom Cruise in the role of 6-foot-5-inch, 250-pound-plus Jack Reacher in the 2012 movie of the same name. If it's action you want, you'll get an overload here. It begins as Reacher is called back into As part of the "praise" for the book at Amazon.com, another favorite author of mine, Stephen King, calls this "The best one yet." It may not be the best I've ever read, but it's sure close to the top. The only real downside was the monumental effort it took not to envision the comparatively scrawny Tom Cruise in the role of 6-foot-5-inch, 250-pound-plus Jack Reacher in the 2012 movie of the same name. If it's action you want, you'll get an overload here. It begins as Reacher is called back into service for the State Department and the CIA, who inform him that someone has taken a shot at the president of France. The bullet was American-made, and the super long-distance shot could have been pulled off by less than a handful of snipers (even though it missed the target by a few hairs). One probability comes to mind immediately - John Kott, who, thanks to Reacher, spent the past 16 years in prison and was released recently. Almost all of the time, Reacher works solo; but this time, he gets a rookie partner named Casey Nice (young and beautiful, naturally) - and it's hard for Reacher to forget thinking about a different female partner who bit the dust on his watch years earlier. Nice proves herself to be competent, which is nice, but he still doesn't want the same thing to happen again. Trying to catch the shooter before he tries again - the conventional thinking is that the next target will be one (or more) of the world leaders who will be attending an upcoming G-8 summit - puts both Reacher and Nice within shooting distance of mobsters from various countries and, of course, whoever turns out to be the sniper. If it is Kott, the whole scenario could change; his reason for killing (and his intended target) could turn out to be very personal. If you have been reading Jack Reacher novels, you surely know what to expect. Jack Reacher books are great to relax with. As a tough guy speaking his mind, and very resourceful, he is a character who is fun to read. There has been a shot taken at the French President. There are four possible snipers who could have taken that difficult shot. One of them is John Kott, who has a grudge with Reacher who sends him to jail, and he has just completed his sentence. 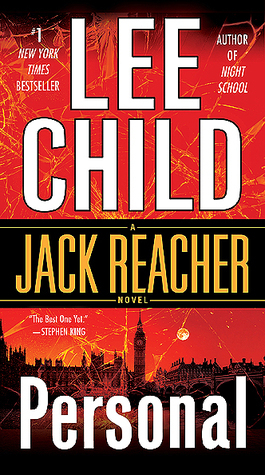 Reacher now takes off to Europe with an If you have been reading Jack Reacher novels, you surely know what to expect. Jack Reacher books are great to relax with. As a tough guy speaking his mind, and very resourceful, he is a character who is fun to read. There has been a shot taken at the French President. There are four possible snipers who could have taken that difficult shot. One of them is John Kott, who has a grudge with Reacher who sends him to jail, and he has just completed his sentence. Reacher now takes off to Europe with an enthusiastic Ms Casey Nice for company. After a lot of violence with gangs in London, the story heads to a climax. Personal is a thrilling novel at times, but after the first few chapters, it becomes really repetitive and dull. I joined Goodreads in October 2011 and other than regularly loading my books into my GR library, I was not active as a reviewer or a commenter until several years ago. I read "Personal" as a paperback in September 2014 and at some stage I awarded it a one-star 'DNF'. "Personal" is one of three "Jack Reacher" novels that I have awarded a 'one-star DNF'. A number of my GR friends have awarded "Personal" 4.0 or 5.0 stars and one friend in particular, William D, has commented that whereas our tastes are generally similar, he had awarded "Personal" and the other two of my three 'DNF's', 4.0 stars each. We both wondered aloud about this dichotomy, so I resolved to review each novel again and determine whether or not the 'DNF's' were justified. Apparently I am blessed with a (probably defective!) memory that enables me to read or listen to a book at least twice while remembering only vague generalities during the second reading (listening), because I certainly have no idea when I actually 'DNF'd' "Personal" and I am surprised that I remembered literally nothing about the book at all. This the Jack Reacher who has been missing in my reading/hearing of novels "#18, #19, and #20". Loaded with the usual detailed repetition (weapons and ammo; etc.) which are part of the Jack Reacher 'charm', "Personal" was chock-full of high paced action, unimaginably bad 'baddies', untrustworthy 'goodies' and several very attractive women. Surprisingly Reacher kept his zippers in place and neither of the women tempted him to do otherwise. I was a Lee Child fan before Lee Child was cool (my hazy recollection is that I started reading him around the time of his first novel), and as such, I have spent a lot of time recommending his novels to people. Each one seemed as crisp and exciting as the last. But in the past several years I've started to worry. Child seemed to be falling into the problem so many series authors have. How do you keep the formula fresh to the reader and interesting to the author? The absolute rock bottom was Not I was a Lee Child fan before Lee Child was cool (my hazy recollection is that I started reading him around the time of his first novel), and as such, I have spent a lot of time recommending his novels to people. Each one seemed as crisp and exciting as the last. But in the past several years I've started to worry. Child seemed to be falling into the problem so many series authors have. How do you keep the formula fresh to the reader and interesting to the author? The absolute rock bottom was Nothing to Lose, the weakest Reacher novel, in which Lee Child's personal politics (no matter how much I agree with them) overtook his need to create a compelling story. Subsequent books have been okay, but have felt more like eating a bag of potato chips than a satisfying meal you want to tell your friends about. That's why it is great to see Child rebounding with Personal, a book in which, following an assassination attempt on the President of France, Jack Reacher is called upon to help track down the man believed responsible, a former sniper that Reacher once arrested. In a novel that spans several countries, Reacher teams up with rookie agent Casey Nice to help track down the sniper and accomplices and bring him to justice before he can create havoc at the G8 summit. After several recently disappointing books in this outstanding action driven series, I'm very happy to report that Lee Child is back with what might be his best book in the series. Jack Reacher is asked by a US Army General to join a multinational team to interdict a sniper who might have taken a shot at the French President in Paris and may be planning more high profile assassinations in London. Reacher accepts the assignment because he once arrested the American suspect and sent him to Leavenw After several recently disappointing books in this outstanding action driven series, I'm very happy to report that Lee Child is back with what might be his best book in the series. Jack Reacher is asked by a US Army General to join a multinational team to interdict a sniper who might have taken a shot at the French President in Paris and may be planning more high profile assassinations in London. Reacher accepts the assignment because he once arrested the American suspect and sent him to Leavenworth for 15 years which makes him uniquely qualified for the task. Something a little different, this time around ... in that this was the first one of these I've read in years that I didn't primarily read in a steel tube (airplane or train) and/or hotel room.... I've come to find that the series comfortably passes the time while traveling ... doesn't take too much concentration ... not much art in the prose ... not listening for the music as I re-read passages ... not tasting the words in my mouth ... but, then again, good momentum, high entertainment value, f Something a little different, this time around ... in that this was the first one of these I've read in years that I didn't primarily read in a steel tube (airplane or train) and/or hotel room.... I've come to find that the series comfortably passes the time while traveling ... doesn't take too much concentration ... not much art in the prose ... not listening for the music as I re-read passages ... not tasting the words in my mouth ... but, then again, good momentum, high entertainment value, for long days and nights of sleep-deprived and jet-lagged travel. Well, now I remember why I tend to read these while traveling rather than in the quiet comfort of my home.... A great way to pass the time, but, other than that, well, ... nah, on second thought, ... the series is a great way to pass the time (and, to the extent I travel a lot, there is significant value in that, at least to me). Having said all of that, the first few hundred pages reminded me why I've stuck with the series - I thought the hook was pretty good, and the basic set-up was well constructed. Conversely, the last 50-70 pages was (extremely) disappointing, felt (badly) rushed, and left me wondering whether this installment had a lot of potential until the author, Child, bounced up against a publisher's deadline and just threw in the towel. But, maybe, that's just me. Lee Child's Reacher character is one of my original favorite "hammers." He is the quintessential pragmatic man. A creature of a mostly black and white world, Reacher recognizes his actions and results are always influenced by outside forces. A case in point, he designs every strike knowing that the plan never survives first contact with the enemy. From that point forward, the victory goes to the quickest thinker. Much of this tale, and the included action scenes, revolves around that premise. As Lee Child's Reacher character is one of my original favorite "hammers." He is the quintessential pragmatic man. A creature of a mostly black and white world, Reacher recognizes his actions and results are always influenced by outside forces. A case in point, he designs every strike knowing that the plan never survives first contact with the enemy. From that point forward, the victory goes to the quickest thinker. Much of this tale, and the included action scenes, revolves around that premise. As a result of a past moral debt, Reacher returns to governmental service, albeit in a civilian capacity, to identify and capture the person responsible for taking an ultra-long-range shot with a .50 cal rifle at the president of France. The most likely suspect is a man Reacher put in jail once before. The story starts in the United States, but quickly moves to France, where the reader is treated to a view of the underbelly of French society. It appears one or more groups of ethnic organized crime entities is helping the shooter. As with most of the Reacher novels, a plethora of bad guys exist, providing fodder for the killing machine that is Jack Reacher. Here's where I add that the antagonists all deserved to die because Child paints them all as amoral killers. In a slight change from past books, Reacher is provided a sidekick early on, a rookie CIA analyst with personal and professional doubts. As usual, I won't provide too much story line. I will say that this tale moves quickly and the main characters are engaging. Action is abundant, though often overdone. One disappointment for me, while I enjoy the scientific/physical insight Reacher brings to each fight or battle plan, I felt the descriptions and reasoning seemed forced. This added to my perception that some scenes were over the top. Still, Child's novels and the Reacher character remain among my favorites. On a more detailed scale, I provide Personal by Lee Child with a 4.2. In a bus station in Seattle, Jack Reacher comes across a copy of the Army Times with a classified ad addressed to him with instructions to make contact. Reacher does and is quickly swept up into a race against time to stop a potential assassin from taking out the heads of state of the world superpowers at an upcoming economic summit. One of the potential killers has a connection to Reacher -- he was put behind bars years ago during Reacher's time in the army. And it appears the potential assassin In a bus station in Seattle, Jack Reacher comes across a copy of the Army Times with a classified ad addressed to him with instructions to make contact. Reacher does and is quickly swept up into a race against time to stop a potential assassin from taking out the heads of state of the world superpowers at an upcoming economic summit. One of the potential killers has a connection to Reacher -- he was put behind bars years ago during Reacher's time in the army. And it appears the potential assassin has an ax to grind with Reacher and wants to take him out as well as the heads of state. The nineteenth entry in Lee Child's Jack Reacher series Personal is most disappointing one I've read so far. Usually the novels narrated by Reacher have been among my favorites in the series, but Personal never quite clicks and spends seemingly long periods of time with Reacher doing little or nothing to impact the investigation or the plot. Part of the problem is that Reacher is part of a team this time around. The character has had help in the past, but he seems less the unstoppable force that he has been in previous novels. In fact, there were points during this book that I found myself double-checking to make sure this was a Reacher novel and not so other standard thriller I'd picked up. But every few pages, I'd be reminded of Reacher's love of coffee and diners and the portable toothbrush is the greatest invention in the history of humankind so I knew I wasn't reading the wrong book. I've made this observation before, but I think it bears making again here. In the past year or so, Child has published several Reacher novellas and stories that felt a bit rushed and left me wanting for more and a couple of Reacher novels that felt like a short story expanded far past their natural length. Personal continues this trend, feeling more like a solid novella or short story than a full length novel. When a shot is fired at the French president in Paris, Jack Reacher is recruited to apprehend the rogue sniper before he causes havoc at a forthcoming G8 meeting in London. Reacher teams up with a female rookie agent called Casey Nice. With global stability at stake failure is not an option. The suspected shooter, John Kott, one of the world’s best snipers, has recently been released from a lengthy stint in jail. It was Reacher who put him there. The action takes in rural Arkansas, Paris and Lon When a shot is fired at the French president in Paris, Jack Reacher is recruited to apprehend the rogue sniper before he causes havoc at a forthcoming G8 meeting in London. Reacher teams up with a female rookie agent called Casey Nice. With global stability at stake failure is not an option. The suspected shooter, John Kott, one of the world’s best snipers, has recently been released from a lengthy stint in jail. It was Reacher who put him there. The action takes in rural Arkansas, Paris and London, where a gang is believed to be harbouring the sniper. Reacher and his sidekick’s escapades include confronting a Serbian mob and a gargantuan brute. The story culminates with a surprising revelation. Personal is an engrossing first person thriller, complete with a complex conspiracy and colourful cast of characters. The storyline feels fairly realistic and the settings atmospheric. There is considerable focus on strategies and scenarios, though these are never tedious or excessive. Reacher is an intriguing protagonist. He is tough, formidable, uncompromising and pragmatic, but also humorous and respectful of women. The extensive use of analysis and evaluation does slow the action somewhat on occasion, diminishing its impact. And one is forced to wonder whether Reacher is getting a little long in the tooth for some of the capers he finds himself in. After all his mother was a WWII French Resistance fighter, albeit a teenage one, which presumably makes our hero close to 60. Is the ageing author living out a fantasy through his alter ego? This reader was none the less very impressed by this, his first Jack Reacher thriller. He eagerly awaits reading further instalments of the best-selling series. A sniper tries to shoot the President of France from more than 3/4 of a mile away, a shot that could only be made by the most elite. While the bullet did not go through the protective glass, the G8 security agencies are worried about an upcoming summit in London. The list of candidates is quickly shuttled down to three men, a Brit, Russian and American. The American turns out to be a recently paroled man who Jack Reacher put in prison for 15 years. Reacher has a favor called in by a friend and i A sniper tries to shoot the President of France from more than 3/4 of a mile away, a shot that could only be made by the most elite. While the bullet did not go through the protective glass, the G8 security agencies are worried about an upcoming summit in London. The list of candidates is quickly shuttled down to three men, a Brit, Russian and American. The American turns out to be a recently paroled man who Jack Reacher put in prison for 15 years. Reacher has a favor called in by a friend and is teamed with a young CIA agent, Casey Nice, to track down this sniper, in conjunction with a Brit and Russian. When the Russian is killed by a long-range shot intended for Reacher, that is blown off course, the action heats up. Reacher becomes embroiled in a turf war in East London with the Serbians. Reacher is a drifter and in this 19th book, he is far afield in most ways. Good twists at the end. Note: 4 stars is a bit generous actually. Nineteenth in the Jack Reacher thriller series revolving around a lone wolf, retired from the army and exploring his America. A special thanks to NetGalley and Bantam Press for allowing me to enjoy this eARC. Child knows how to pull a reader in. Of course, "knowing" Reacher, Child already has quite a bit set up for us ahead of time, lol. I do love "listening" to Reacher make his conclusions. His questions. His curiosity. His knowledge. Although…I don't remember Reacher thinking about the So Nineteenth in the Jack Reacher thriller series revolving around a lone wolf, retired from the army and exploring his America. It's part of what I love about Jack Reacher (and other stories/series of this ilk) is the intelligence and observation required. That ability to make deductions from the information gleaned, and to act on it. I know how little I observe around me — even though I want to think I see a lot. Just had a thought — shocking, I know *grin* — being Jack Reacher is similar to being an editor. Reacher knows so very much about how his world works — I'm thinking about his knowledge of snipers, guns, making one's bones, the AK-47, government identification, and more — and an editor has to know about his or her world. The one of words, sentences, plots, and more. It's a detailed knowledge, knowing the nuances of a word being used whether it's correct for the time period, for expressing that thought in the story. Soooo, maybe we each have our own strengths of observation, lol. Oh, crack me up. Yep, Reacher is unconventional if only because he thinks ahead, plotting out all the angles. After all, people are people with the same motivations, dreams, plans all over the world. We're not so different from each other. It's also human nature when he analyzes Nice's motives and explains the difference between CIA and military. Some very excellent points there as well. There's that intriguing look behind the EU politics with that bit about why the Polish and Greek governments are suddenly about to have elections. "…if it's some big terrorist statement … it's probably not Italy. I mean, who would notice? Those guys change every three weeks anyway." Hmmm, Sherlock Homeless. An interesting nickname, and it certainly fits Reacher *grin*. "…you should take that washing machine out of the yard. I don't think it's compulsory." Yep, it sure was an interesting trip out to Arkansas, and it was amazing how much information Reacher pulled out of it. Of course, Kott did leave quite a bit of information. Enough that it would knock me back a few miles. Not feet…miles, or at least 1,400 yards. LOL, that initial beginning in Paris…interesting to see how alike these handlers were *more laughter*. It was sweet too, Reacher taking the time to see his mother's grave. I wish Child had said why Nice has that nasty beat-up vehicle. What was her reasoning for it? Is it simply because it's so outside the box? Is she gonna keep it? I hope we'll see her again in future installments. Scarangello though, I'm not keen on making her acquaintance again. I didn't care for her comment about Reacher being as bad as Kott. I don't get where she's coming from, especially when she's CIA. I'd say, right off the bat, that she's a more likely candidate way before Reacher! There's a lot of back history going on in this story. The AK-47 and the reason for its creation, which makes perfect sense. And how very sensible of the government (who knew a government could be sensible??) to plan for it. The behind-the-scenes details on how a G8 conference is choreographed. The fears behind it for the players. There was one area in which Personal was completely unlike any previous Jack Reacher story. Tell me if you pick up on it! Wow, that ending. It was something of an anticlimax, that betrayal, I had expected something completely different, yet this made so much sense. A shocking example of truth in human nature. And, as Bennett says, "We didn't rule the world by being nice." And yes, I'd enjoy reading more about this character as well, lol. It was a long-range shot at the French president that started it. Only a few snipers in the world were skilled enough. It’s the why behind the U.S.’s concern about the attempted assassination that has Reacher curious. Then comes London and two very angry gangs, which MI5 is likely to be very pleased about. Jack Reacher has been retired from the army for years and spent that time roaming America, but the army hasn't forgotten him. And Reacher realizes ruefully, that he's much too predictable. Dominique Kohl was one of Reacher's failures, at least in his own mind. Casey Nice is assigned through the State Department; she's actually CIA. Antonio Luna is a very good friend of Casey's. Joan Scarangello is also CIA, older, deputy to the deputy director of operations. She knew Joe Reacher and tries to use that. Brigadier General Rick Shoemaker is second-in-command to General Tom O'Day. Direction Générale de la Sécurité Extérieure is the French version of the CIA. Karel Libor was a big-deal Albanian gang leader. Wallace Court is where they intend to hold the G8 conference. The Romford Boys are led by Charlie White with his lieutenants: Tommy Miller, Billy Thompson, and the real "power behind the throne", the enforcer, Little Joey Green, a real brute of a man. He's enough to scare Nice off her crutches. Gary is one of Little Joey's team leaders. GCHQ (Government Communications Headquarters) is the British version of the NSA. John Kott was originally from Arkansas and was snapped up for sniper school. He was incapable of distinguishing between real life and the battlefield. William Carson is an ex-SAS operator with 50+ kills to his name, at some incredible distances. Fyodor Datsev is the Russian, ex-KGB. Rozan is the Israeli, and the best they ever saw with a fifty-caliber Barrett. Yevgeniy Khenkin is Sluzhba Vneshgney Razvedki, or as Yevgeniy says "KGB really, old wine, new bottles". He was Datsev's handler back in the day. Bennett is the English representative with an interesting character. Very stereotypical English in fact. He could be MI6, he can be anyone you want, it's all pretty fluid at the moment, lol. The cover is shades of gray — how appropriate! — with a lone man standing on a deserted road leading to the Capitol building. One man facing down government. I think this was the first in the Jack Reacher series I couldn't wait to finish. Just not my cup of tea this time -- the plot, London setting, bland, uninteresting supporting characters. Even Reacher's voice seemed "off" to me in this one. Not sure what happened here (maybe it's just me), because the previous in the series was one of my very favorites, and I gave it five stars. Hoping for better in the next installment! Reacher's pulled into a hunt for snipers, both from abroad & a home-trained one that Reacher arrested before...partnered with another young female CIA operative, feeling guilty about another one he lost under his tutelage, Reacher is on the hunt in Europe & the US...So-so Reacher, but because it IS a "Reacher" 4-stars!